Rhydymwyn Valley is located in North Wales, not far from Mold. It’s a lovely little isolated spot, but it’s also been concealing a secret for over 75 years- part of Britain’s hidden wartime history is located just to the south of the village. In 1939, the government purchased a 35 hectares area of the Alyn Valley which was developed as a chemical weapons factory and storage facility, named M.S. Factory, Valley. Over 100 specialised buildings were eventually constructed across the site, eventually growing to cover 86 hectares. A few years later, the early development of the UK’s atomic bomb project took place here. M.S. Factory, Valley was so secret that it did not appear on any Luftwaffe bombing maps. However, what I’m interested in is buried beneath its surface.Alongside the building work, an underground tunnel system was dug for the storage of mustard gas. While use of the gas for attacking purposes was banned, it could still be used for defensive or retaliatory attacks, hence its stockpiling. 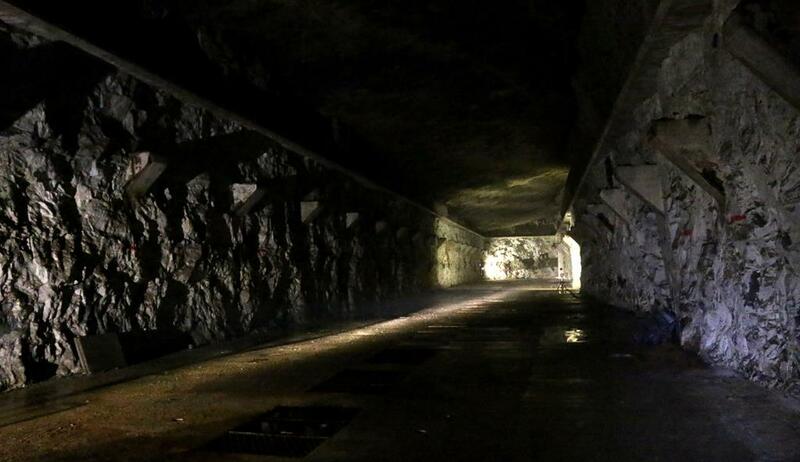 After the war, the tunnels actually held the majority of the country’s mustard gas stock from 1947 to 1959, when Britain relinquished its chemical weapons capacity. After this, they had a variety of roles. For example, as a bulk storage depot for emergency supplies. M.S. Factory, Valley closed in 1994 and today it is a nature reserve run by the Rhydymwyn Valley Historical Society. 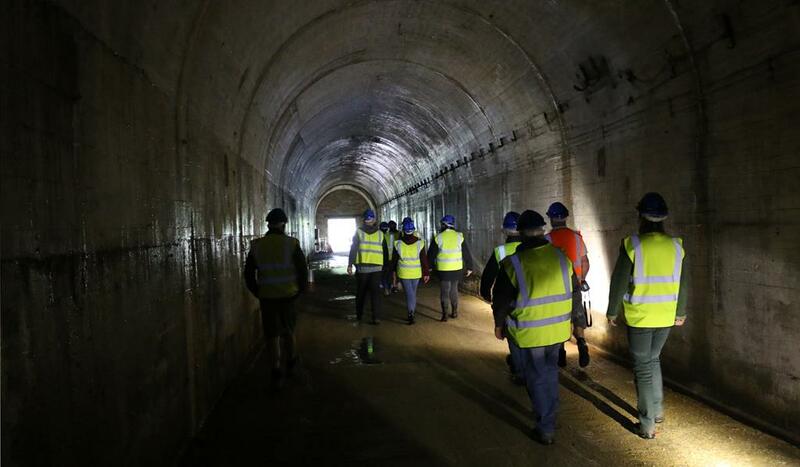 They’ve been running tours of the tunnels on selected dates since 2017, and I managed to book myself onto one of the tours taking place in mid-July. A group of 12 met at the valley’s visitor centre, before driving down to the tunnels in convoy. En route, we passed through an overgrown landscape on still-decent road surfaces. Most of the buildings were demolished when the site closed, but a couple still stand. For example, Building P6 was where the atomic research took place and it is Grade II listed. 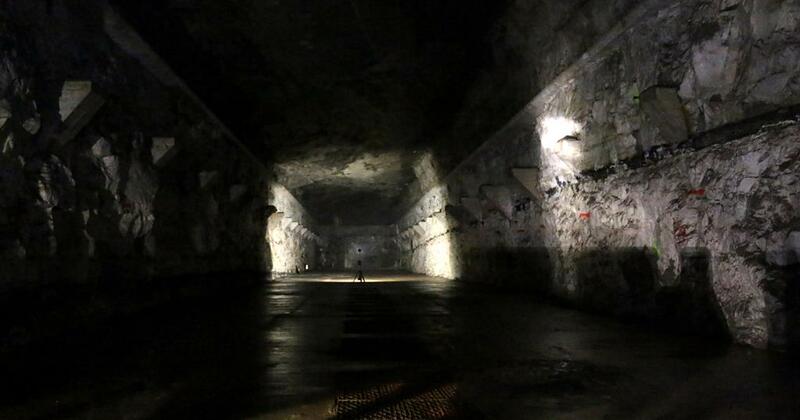 Upon arrival at the tunnel entranceway (Of the three original tunnels, two are now sealed and inaccessible), hard hats were donned and walking boots laced up before venturing inside, with a couple of volunteers leading the way. 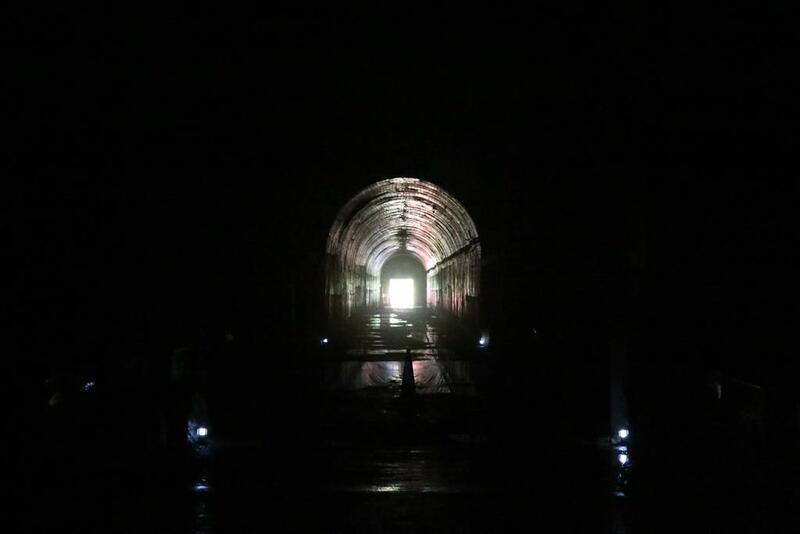 With remnants of the air-supply system still visible overhead, we stroll through the tunnel entrance with high-powered flashlights illuminating the route ahead. Concrete pillars jut out of the wall on either side, originally the support method for a false ceiling. The air inside is cool, with the floor dotted with puddles of standing water. After a short walk, we come to the first of three enormous storage caverns, whose far ends connecting with the other two tunnels. 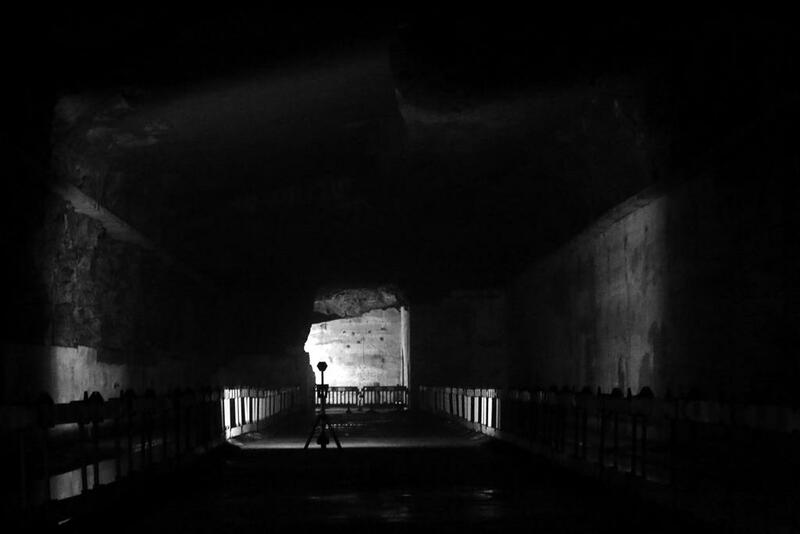 Lights have been setup to light up the spaces, but they seem swallowed by the darkness. Travelling onwards to view the others, the torchlight catches small stalactites in its glare, hanging from the ceiling deep in the caverns. There’s very little evidence of the tunnels history to see, but on the way out our attention is drawn to three pieces of wartime graffiti drawn on the wall. The last is an unidentified ship, sailing across the sea. Nearby, some holes in the tunnel floor reveal an unusual site – the river Alyn, culverted when the tunnels were originally built, still flowing today in the darkness. For more information, I recommend visiting the website of the Rhydymwyn Valley Historical Society. 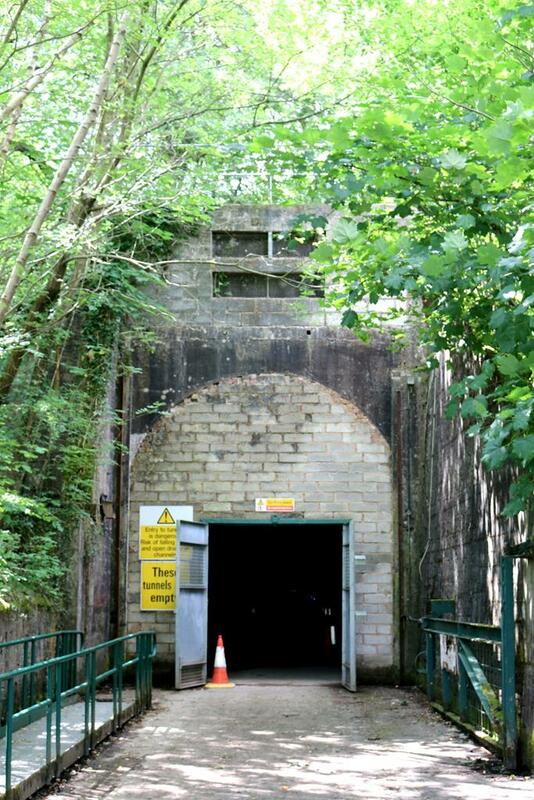 There you can find out about the history of the site, how and when you can visit, plus future tunnel tours.